Francis Shergold died on November 27th, just two months shy of his 90th birthday. 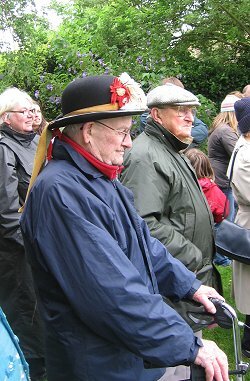 He was widely known in the folk world as long-time leader of the morris dance side at Bampton in Oxfordshire, a position honoured some years ago by the EFDSS when awarding him their Gold Badge. When he first started dancing, in 1935, there was only one active morris team, that led by William 'Jingy' Wells. During his active career he saw the brief reactivation and subsequent demise (after Whitsun 1941) of the second team, led by the Tanner family; the breaking away by Arnold Woodley in 1950 to form a second side composed mostly of young boys, which continued until the end of that decade; the regrouping of that set (now with grown men) in 1970, so that, once again, two sides were competing for dance spots on Whit Monday; and, finally (to bring the situation up to the present), the breakaway group from the Woodleys in 1974, to form another set, which led to the situation of three distinct teams out and about on the dancing Monday. I rehearse all this to highlight a kind of ironic paradox. When he first joined there were half a dozen active dancers. By 1959 there was so little interest in the custom that he was forced to take out a set with only four men, using outsiders from the folk revival as musician and fool. On Spring Bank Holiday Monday this year there were more than fifty dancers spread between the three teams. And it was Francis who kept it going, firstly by being there when needed as a teenager, then assuming the responsibility of leadership upon the death of 'Jingy' Wells, and even appearing in whites long after formally passing on the leadership to Tony Daniels. In fact, famously, he told the story of how Wells, on his deathbed, had said to him, "Don't let the morris go." Through lean times and prosperous he never did; now the morris has been forced to let him go. The accompanying images date from 26 May 2008, and feature what was surely his final appearance with his dancers. Several images show him, walking-frame in hand, joining in the final dance-off movement of Bonny Green Garters. Over the course of seven decades he must have performed that many hundreds, perhaps thousands of times. Registered medically blind for a good number of years (though retaining some degree of vision), he was able nevertheless to recognise people he knew either by their voice, or (in my case) by my bulk! And he remained cheery throughout. Two months ago he suffered a stroke, and was taken into the John Radcliffe Hospital, Oxford. His health deteriorated steadily, and he finally succumbed on the 27th. 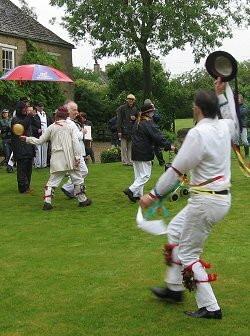 Some of we outsiders will have the honour of attending the annual morris dancers' party in Bampton tomorrow evening. I would expect the mood to be a little less boisterous than usual, but nevertheless celebratory, honouring a man with a life-spanning career as dancer. In an obituary for Arnold Woodley, written thirteen years ago, I said that the morris would never seem the same again. Those sentiments are certainly echoed here. It will carry on now but, without the presence of Francis, that sense of history, extending back to into the dim and distant past before many of we afficionados were born, will be missing, and the whole thing seem ever more rooted in the 21st century. Our sympathies are extended to his brother Roy and sister Ruth, and their children. Rest in peace. The funeral will be at St Mary's Church, Bampton, on Monday 8th December, at 2:00. His family have requested that people do not take flowers or wreaths but if you want to give something, a donation to the Bush Club (Bampton) would be appreciated. Also would any Morris men please refrain from wearing whites. Thank you. You may also wish to re-read Keith Chandler's excellent article on Francis, which has been on this site since 1998. And you may also be interested in the Ellen Ettlinger webpage, which contains some early (1940s/50s) Bampton photos: http://england.prm.ox.ac.uk/englishness-Dance-images-from-Ettlinger.html - Ed.